Strong growth estimates in response to a stimulative fiscal environment (Atlanta Fed’s GDP Now forecast suggests second-quarter growth could surprise to the upside, maybe even over 4%, exceptionally high). Rising interest rates; the Fed is “expected” to raise the Federal Funds Rate another 50 basis points over the next six months, which will likely filter through to other rates. Stronger inflation readings and continued strength of the labor market put pressure on the Fed to raise rates faster. Increasing wages despite average wage growth being slow. New jobs created in lower-paying service sectors mask the increase in wages of existing positions and the difficulty of firms to find qualified labor. Over the next few issues of the Barometer we will devote some space to a special focus analyzing the region’s economy and changing employment dynamics. Because there is no perfect statistic, each issue will focus on one way of viewing the data; over time we will build a deeper knowledge of our local region together. 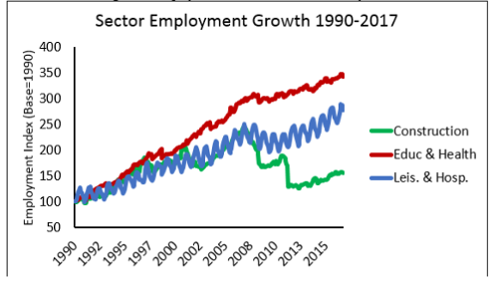 We’ll start by looking at employment by sector and how it has changed over the last 25 years. Future topics may include compensation, turnover rates, etc. In this issue, we focus specifically on differences between “cyclical” and “seasonal” trends and explore where there are opportunities for growth. To draw out sectors with very different patterns, let’s look at three important sectors in the region: leisure and hospitality, construction, and education and health services. 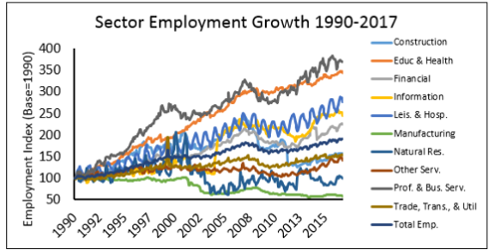 Figure 2 shows each sector’s employment levels over time, indexed to January 1990. Each line represents monthly employment from 1990 through 2017. There are some clear differences between the sector’s patterns. Take leisure and hospitality, the blue line. Unsurprisingly, employment in leisure and hospitality oscillates across the sample, reflecting seasonal swings in the sector. Seasonality is not unusual, and many economic statistics including national unemployment and GDP numbers are adjusted for seasonal patterns. However, adjusting out the swings obscures the reality of lean times for seasonal workers in the off-season. Education and health services, the red line, follows a steadier, more consistent path; the industry does not indicate a strong seasonal trend. (Turns out we get sick and go to the dentist year-round…) Finally, construction, the green line, illustrates a cyclical pattern rather than a seasonal pattern and follows the broader, and less predictable, business cycle. The recessions of the early and late 2000s are clearly evident in the construction industry. All too often we focus on the unemployment figures for a region or average wage growth, but the aggregate numbers often mask the underlying differences between regional industries and may obscure opportunities and threats. For example, the more economically reliant we are on construction and residential growth, the larger the swings in economic activity when recessions come along. Other industries are not immune to economic downturns, just not as sensitive as construction. In finance parlance, the sensitivity to overall market activity is called beta and construction has a beta greater than one, indicating larger swings than the market as a whole. In simple terms, a strong reliance on cyclical industries means that when times are good, they’re really good, and when they’re bad, they’re really bad. Finally, let’s talk about how these patterns reveal opportunities for growth. The cyclical nature of our leisure and hospitality industry is one such opportunity. During peak season, the region often bumps up against its capacity to accommodate visitors (think full parking lots and “no-vacancy” signs) but there is potential for growth in the off-season. One avenue for improving the quality of life for residents is to smooth out the seasonality of an industry, in our case, fill in the “off-season” with other events. The addition of the Embassy Suites is expanding our convention potential and is one step in this direction. The development of a Westin hotel and the accompanying spa may also provide opportunities outside of peak beach season; I’m sure you can think of more. While there is more than one way to develop a regional economy, considering the seasonal and cyclical patterns of our local industries will help us to identify where the risks are and, possibly more importantly, where the potential lies. 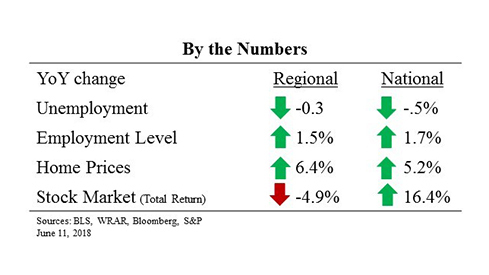 In the next issue, we’ll dive deeper into how our regional economy has changed over the years. For now, enjoy peak beach season! Dr. Jones has been with UNCW and the Cameron School of Business since 2010, after obtaining his Ph.D. from the University of Georgia. Prior to joining the faculty, Dr. Jones worked with the Newton County Chamber of Commerce in Covington, GA. He has published in the Economic Development Quarterly, the Atlantic Economic Journal, and the Journal of Economics and Finance. He plans to continue his local public finance and regional economics research at UNCW with a focus on North Carolina issues and tax-base development.